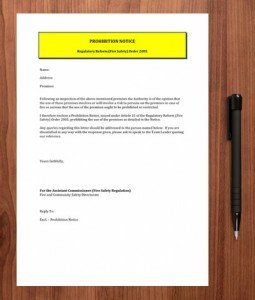 A Prohibition Notice is issued where the use of the Premises may constitute an imminent risk of death or serious injury to the persons using them. The issue of a Prohibition Notice under the Regulatory Reform (Fire Safety) Order 2005 is the most serious Enforcement option available to the Fire Authority, other than prosecution, and can only be authorised by identified Senior Officers. The Prohibition Notice may be a restriction of use, for example imposing a maximum number of persons allowed in the Premise, or a prohibition of a specific use of all, or part of the Premise, for example prohibiting the use of specific floors or rooms for sleeping accommodation. There are things the Responsible Person can do, almost immediately, to lower that Risk, to remove those Hazards, to loosen those Restrictions, lighten those Impositions and lift those Prohibitions.